April 16th is Save the Elephant Day! (also called World Elephant Day). Ringling Bros. and Barnum and Bailey Circus, announced in March, that by 2018, elephants will be phased out of their circus acts! This is after 145 years. Many people have questioned the treatment of these massive and unique creatures and due to this concern,the circus has made this change. As the elephants retire from performing, they will live out their lives at the Elephant Conservation Center, owned by the circus, in Florida.Although, I wish the decision went into effect immediately, I am very happy to hear of their decision. Use the week of Save the Elephant Day to do an activity with your students about elephants! Did you know that elephants can be right or left tusked, similar to how humans are with their hands? Quickly waving of ears, twirling of its trunk and blowing dirt are signs of an angry elephant! The elephant has the largest brain of the animal world. They are very intelligent! Surprisingly, peanuts are NOT a favorite food of elephants. The world's largest LAND mammal, elephants eat about 300-600 pounds of food every day. They are herbivores, non-meat eaters. 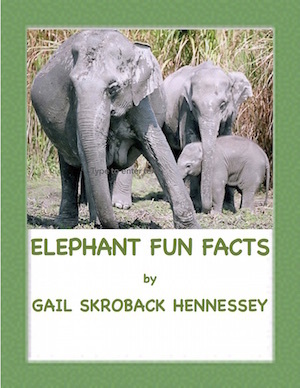 Elephants live in families with females being the head of the heard(called a matriarch). There can be as few as 8 or as many as 100 in a group. Did you know the elephant can use its trunk as a “snorkel” making it possible to swim in deep water. In the last 100 years, the number of Asian elephants in the wild have declined by about 90%due to habitat destruction and killing for theirivory tusks. Elephant throw dirt onto their backs to prevent getting sunburned. Did you know that ever 15 minutes a poacher kills an African elephant? Of the two, Asia and African, there are much less Asia elephants left in the wild. Elephants make a sub-sonic rumble sound to communicate over long distances. The feet and trunks are very sensitive and other elephants can feel the sound being sent over the ground. The word, jumbo, comes from the circus animal by that name. It means "large" or "huge". Elephants walk on average about 4 mph but can actual run up to 24 miles per hour! The skin of an elephant is about 1 inch thick. An elephant tusk can be as long as 10 ft. and weigh over 200 pounds. Elephants are one of the few animals that can recognize itself in the mirror. There are 40,000 muscles, but no bones in an elephant's truck. Did you know that an elephant tooth can weigh up to 12 pounds? * Spread the word of the dwindling number of elephants. * Draw a picture of an elephant. * Write a poem about an elephant using all the letters in the word, elephant, or write a haiku. * Read a story about elephants. 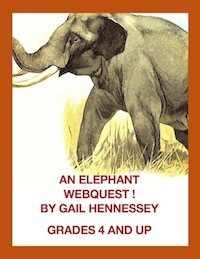 * Read this article on Elephants: http://www.timeforkids.com/news/elephant-alert/86631Write 7 facts learned from the reading.Illustrate one of your facts. Wildlife Conservation Society http://www.96elephants.org/familyTake an elephant elfie.